1 scoop protein powder, 1 mashed banana, 2 tbsp agave nectar, 2 tbsp coconut flour, 2 tbsp buckwheat flour, 1/4 cup unsweetened cocoa powder, 1 egg, 2 egg whites, 1/2 tsp baking soda, 1/2 tsp baking powder and 1/4 cup @lilys_sweets_chocolate dark chocolate chips. Mix all ingredients and bake at 350 degrees for 10-12 minutes. Frosting: 4 tbsp Justin's chocolate hazelnut butter mixed with 1/4 cup @lilys_sweets_chocolate dark chocolate chips. 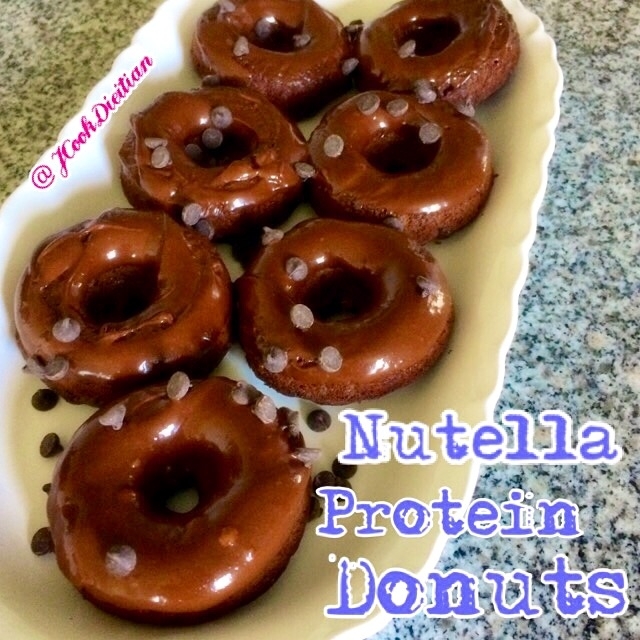 Melt hazelnut butter and chocolate chips until smooth in a microwave (takes about 20 seconds) and top donuts!